Multiplayer is available as a free standalone title. Limited to 100 MB of data (about 200 saves). Behavior screen is unusable due to UI being cut off. Cutscenes are pillarboxed 16:9, use Flawless Widescreen. In-game cutscenes and animations are locked to 30 FPS. See High frame rate to fix. There is no separate anisotropic filtering slider available in the options. Anisotropic filtering is determined by the overall graphics pre-set, labeled "Graphics Quality" in the menu. When modifying individual graphics options to create a custom "Graphics Quality" configuration, the anisotropic filtering setting is determined by the last selected pre-set, regardless of what individual graphics options are selected. Change the GstRender.AnisotropicFilter parameter between 0-4, 4 is the highest. Forcing anisotropic filtering through video driver causes texture shimmering. 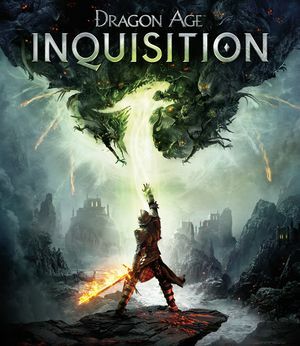 Right click Dragon Age Inquisition icon in the Origin game library. Add -GameTime.MaxSimFps 60 -GameTime.ForceSimRate 60+ to Command line arguments. There is a known bug that causes the opening cutscene in the dungeon after the character creator to not load properly, resulting in the player spawning in the character creator level, with no ability to save. The easy way around this is to disable the fix until after you can save properly. Select game properties, and apply the following line in the dialogue box. There can be some minor issues running this. Use this when playing single player, and after a character is already created. May cause desync of facial animations in long cutscenes. Do not use driver-enforced V-Sync if you are using this command line. Doing so will result in stuttering cutscenes. This fix also works on Need for Speed: Rivals and Battlefield 4. Master, sound FX, dialog and music. See Helix Mod: Dragon Age Inquisition - 3DMigoto DX11 3D Vision Fix. Save as user.cfg in the Installation folder. This fix causes a loss of some visual fidelity. Save as user.cfg in <path-to-game>. ↑ "The PC version of this Software uses Origin Online Activation and Sony DADC Austria AG’s Denuvo content protection technology". Dragon Age: Inquisition EULA. Adding the commands to the Origin launch options does increase the displayed FPS count.